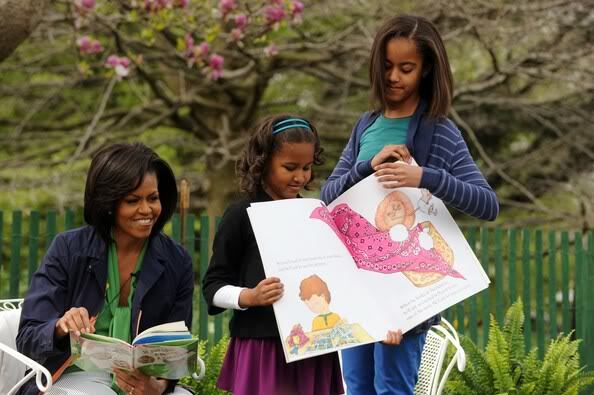 AP~First lady Michelle Obama is getting attention from the Nickelodeon kids’ television network – and it has nothing to do with green slime. 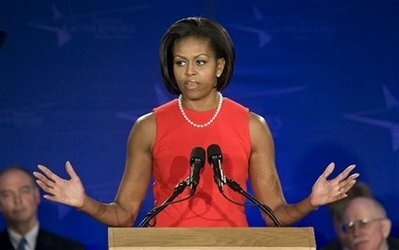 Nickelodeon said Thursday it will honor Mrs. Obama with its “Big Help” award at the Kids’ Choice Awards. She has taped a message for Saturday’s show. 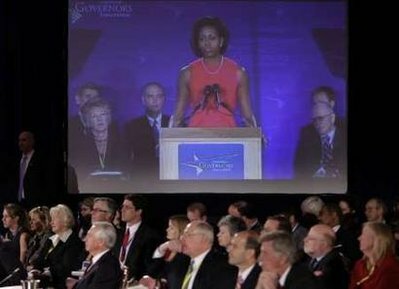 She is being honored for her Let’s Move” campaign to help cut down on childhood obesity. 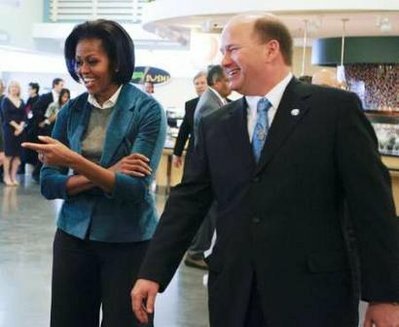 Nick has been working with Mrs. Obama on the campaign. 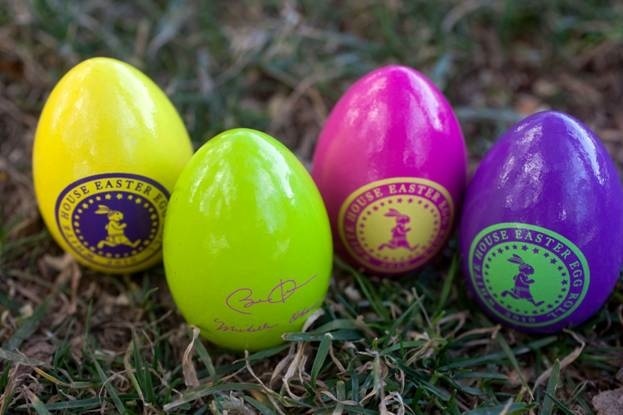 It has donated $3 million to school and after-school programs to create opportunities for physical play. 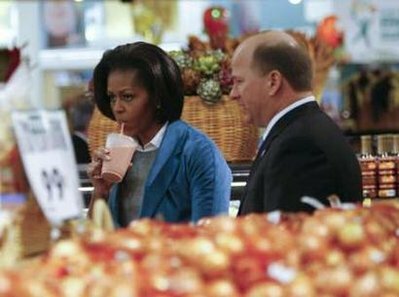 Nickelodeon executive Marva Smalls says that with Mrs. Obama’s activity, forces are aligning not just to place blame but to move forward. 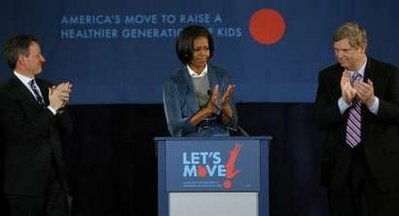 Today First Lady Michelle Obama addressed the National Legislative Conference of the Parent Teacher Association on her Let’s Move! initiative~~a movement pertinent to the National PTA’s efforts toward fighting childhood obesity and promoting healthy lifestyles. The three-day conference is designed to motivate ‘grasstop’ leaders from across the country and provide an in-depth look at the latest PTA Public Policy Agenda through a series of workshops, skill building trainings, panel discussions, and guest speakers. 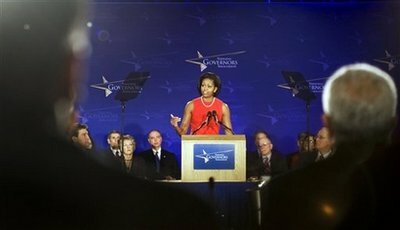 AP~First lady Michelle Obama challenged software and video game designers Wednesday to develop games and tools that get kids, especially 9- to 12-year-olds, excited about eating better and exercising more. The carrot? A chance to share in $40,000 in cash prizes. 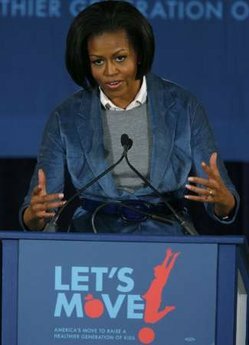 The Apps for Healthy Kids contest is part of Mrs. Obama’s “Let’s Move!” campaign to raise public awareness about the national problem of childhood obesity. One in three U.S. children is overweight or obese, putting them at higher risk of developing diabetes, high blood pressure or other medical conditions. 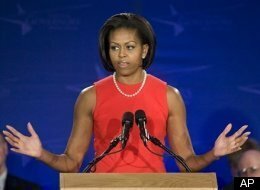 Mrs. Obama said kids spend an average of seven and a half hours a day watching TV or playing with computers, video games or other devices. The Apps for Healthy Kids Challenge is a contest with the USDA to challenge professional and amateur developers to come up with games that incorporate nutritional information and promote healthy living. From dance video games to nutrition mobile applications, they’re challenging designers to come up with the next big idea to make healthy living fun. 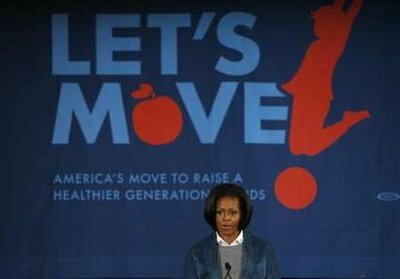 The App Challenge is just one of the innovative ways that the First Lady is working to help kids lead active, healthy lives and end childhood obesity within a generation, as part of the nationwide Let’s Move! campaign. 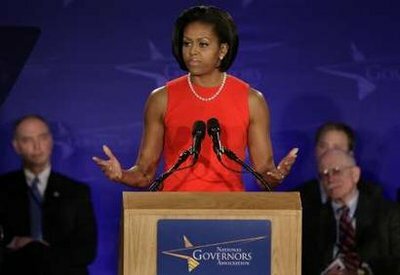 (AP)~~First lady Michelle Obama appealed to governors on Saturday for help in reducing child obesity and said they had a moral and financial imperative to act. She praised states for their steps already and assured state leaders that the federal government had no interest in taking over their efforts. 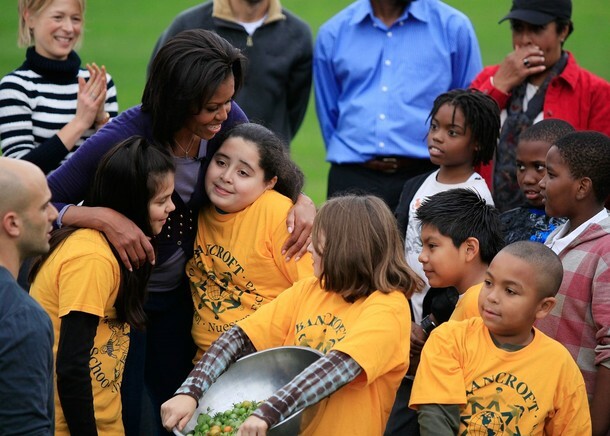 The first lady found a high-powered audience to make the case for her new campaign on obesity. One in three American children is overweight or obese, a condition that raises their risk for diabetes, high blood pressure, high cholesterol and other illnesses. 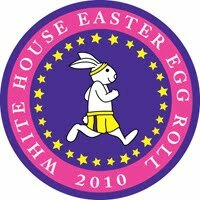 Obama sought support from leaders of both parties and made sure to respect the influence of the states. 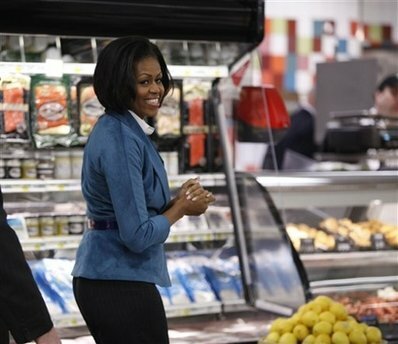 The first lady’s campaign has four parts: helping parents make better food choices, serving healthier food in school vending machines and lunch lines, making healthy food more available and affordable, and encouraging children to exercise more. 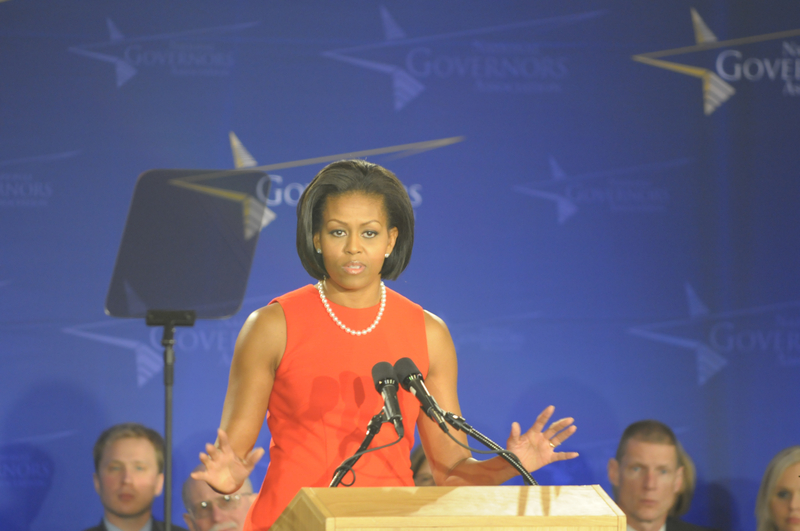 In talking to the governors, she emphasized the importance of empowering parents who feel helpless because they don’t feel they have the time, money or information to provide healthy meals or safe places to exercise. 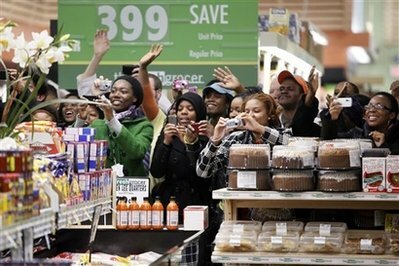 Mindful that the governors face economic crises in their states, Obama said the obesity solutions need not be expensive. 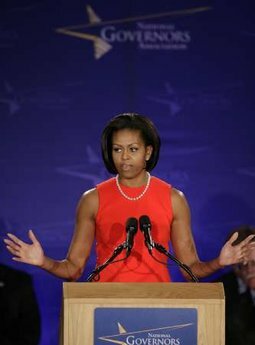 She encouraged them to take steps such as providing access at school ball fields to the community at nights, or requiring the construction of sidewalks when new roads are being built. 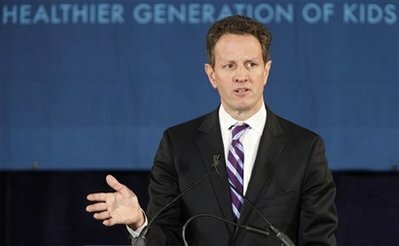 The governors are trying to find political solutions to soaring health care costs as President Barack Obama seeks to do the same. 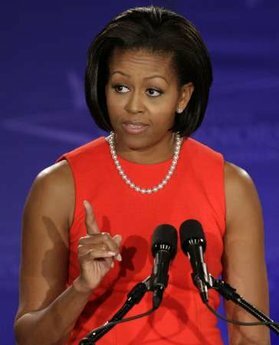 Michelle Obama said the money crunch cannot be solved without addressing child obesity. 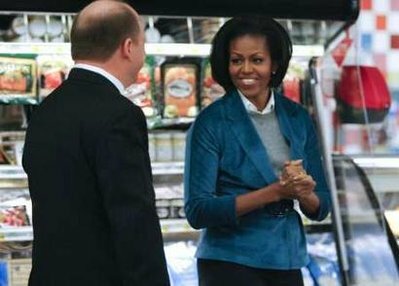 With Treasury Secretary Tim Geithner and USDA Secretary Tom Vilsack in tow, First Lady Michelle Obama traveled to Philadelphia yesterday as part of the Let’s Move! 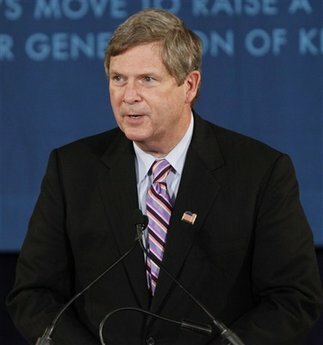 campaign, a nationwide effort to rally the country around one goal, ending the epidemic of childhood obesity. 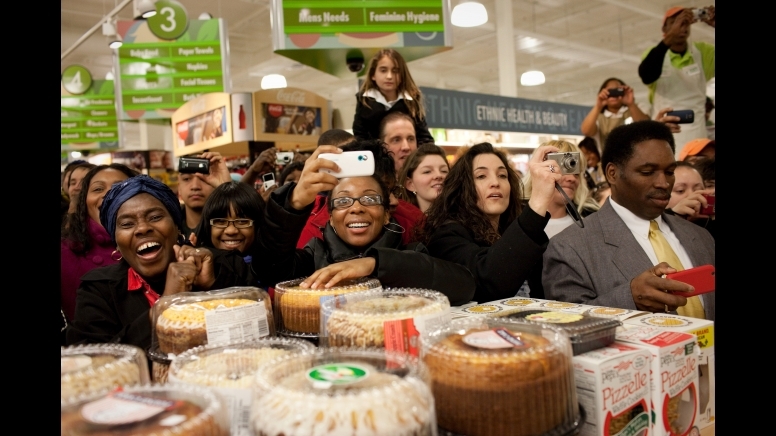 “Six years ago, when this city had fewer supermarkets per person than almost anywhere in America, all right, that was six years ago, when many folks had no access to healthy foods; six years ago many neighborhoods had alarming rates of obesity-related conditions like heart disease and diabetes — the folks in this city, you all could have decided that you had an unsolvable problems on your hands, right? You could have done that. You could have decided that these problems were just too big and too complicated and too entrenched and thrown your hands up and walked away. But instead you all took a stand, a really important, collaborative stand. 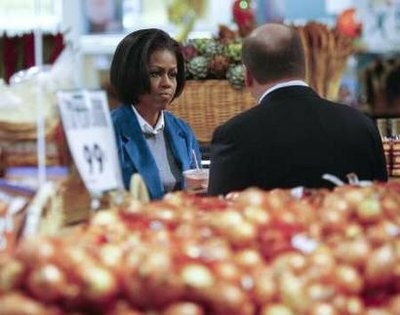 You decided first that no family in this city should be spending a fortune on high-priced, low-quality foods because they have no other options. You decided that no child should be consigned to a life of poor health because of what neighborhood his or her family lives in. And you decided that you weren’t going to just talk about the problem or wring your hands about the problems, but you were going to act. And that’s precisely the kind of determination, the kind of commitment that we need to address the epidemic of childhood obesity in this country. And this issue is an issue of great concern to me, and I’ve said this before, not because I’m First Lady — or not just because I’m First Lady of this country — but because I’m a mother, and I care about my kids and I care about all of our kids. And I know that this issue is a great concern to all of you, everyone around this country. We all care about our kids. 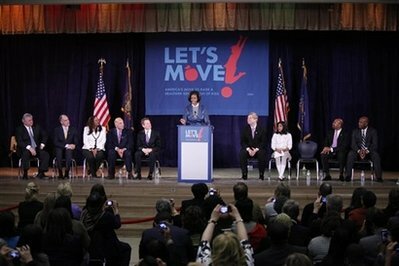 That’s why last week we enthusiastically and proudly launched “Let’s Move.” (Applause.) 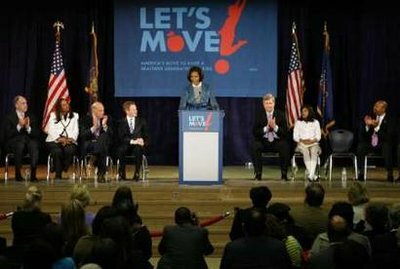 “Let’s Move” is a nationwide campaign to rally this country around one single but ambitious goal, and that is to end the epidemic of childhood obesity in a generation so that the kids born today grow up with a healthy weight. Simple but ambitious. 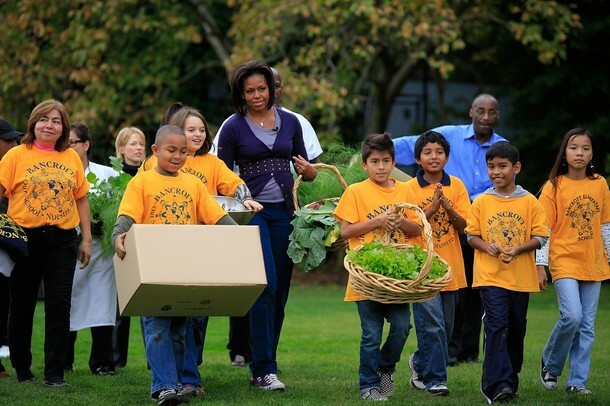 To learn more about what you can do to help solve the childhood obesity epidemic – visit LetsMove.gov and become a fan of Let’s Move! on FaceBook. 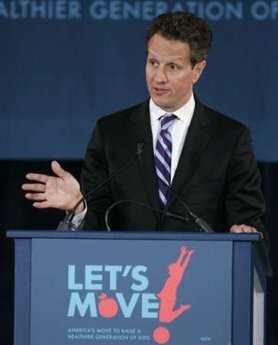 Let’s Move is comprehensive, collaborative, and community-oriented and will include strategies to address the various factors that lead to childhood obesity. 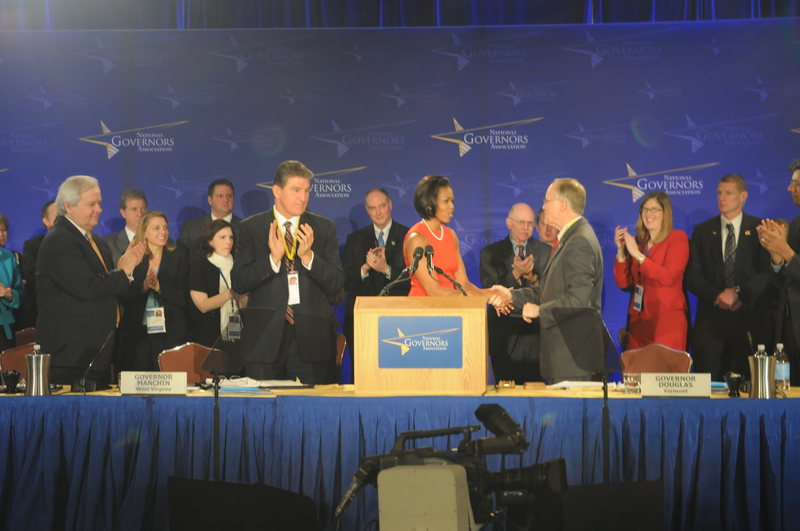 It will foster collaboration among the leaders in government, medicine and science, business, education, athletics, community organizations and more. And it will take into account how life is really lived in communities across the country – encouraging, supporting and pursuing solutions that are tailored to children and families facing a wide range of challenges and life circumstances. 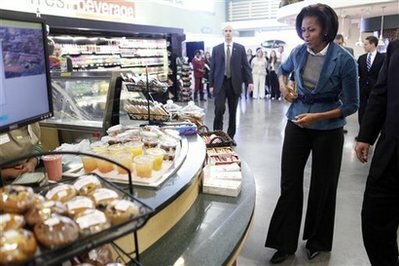 President Barack Obama kicked off the launch by signing a Presidential Memorandum creating the first ever Task Force on Childhood Obesity which will include the DPC, Office of the First Lady, Interior, USDA, HHS, Education, NEC and other agencies. 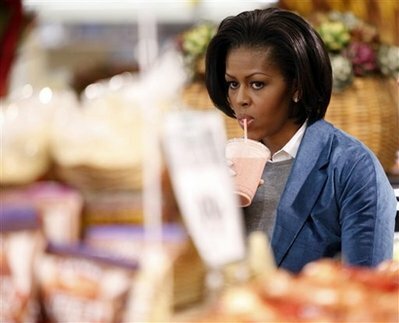 Within 90 days, the Task Force will conduct a review of every single program and policy relating to child nutrition and physical activity and develop a national action plan that maximizes federal resources and sets concrete benchmarks toward First Lady Michelle Obama’s national goal. 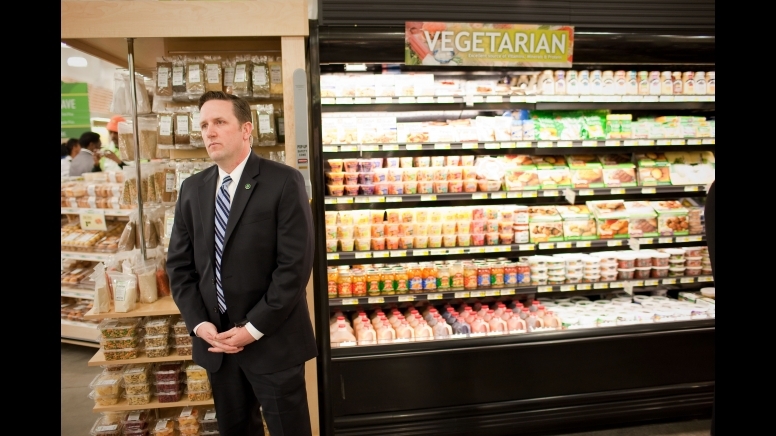 Empower Consumers: By the end of this year, the Food and Drug Administration will begin working with retailers and manufacturers to adopt new nutritionally sound and consumer friendly frontof- package labeling. This will put us on a path towards 65 million parents in America having easy access to the information needed to make healthy choices for their children. Provide Parents with a Rx for Healthier Living: The American Academy of Pediatrics, in collaboration with the broader medical community, will educate doctors and nurses across the country about obesity, ensure they regularly monitor children’s BMI, provide counseling for healthy eating early on, and, for the first time ever, will even write a prescription for parents laying out the simple things they can do to increase healthy eating and active play. Major New Public Information Campaign: Major media companies – including the Walt Disney Company, NBC, Universal and Viacom – have committed to join the First Lady’s effort and increase public awareness of the need to combat obesity through public service announcements (PSAs), special programming, and marketing. The Ad Council, Warner Brothers and Scholastic Media have also partnered with the U.S. Department of Health and Human Services (HHS) to run PSAs featuring top professional athletes, Scholastic Media’s Maya & Miguel, and Warner Brothers’ legendary Looney Tunes characters. Next Generation Food Pyramid: To help people make healthier food and physical activity choices, the U.S. Department of Agriculture will revamp the famous food pyramid. 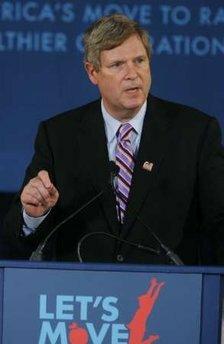 MyPyramid.gov is one of the most popular websites in the federal government, and a 2.0 version of the Web site will offer consumers a host of tools to help them put the Dietary Guidelines into practice. Empower Change: USDA has created the firstever interactive database – the Food Environment Atlas – that maps healthy food environments at the local level across the country. 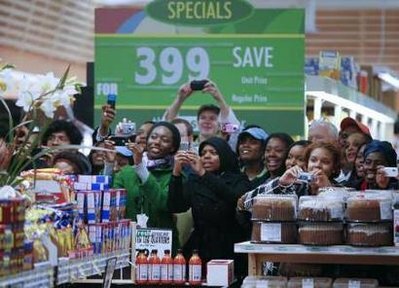 It will help people identify the existence of food deserts, high incidences of diabetes, and other conditions in their communities. This information can be used by parents, educators, government and businesses to create change across the country. LetsMove.gov: To help children parents, teachers, doctors, coaches, the nonprofit and business communities and others understand the epidemic of childhood obesity and take steps to combat it, the Administration has launched a new “one-stop” shopping website — LetsMove.gov — to provide helpful tips, step-by-step strategies for parents, and regular updates on how the federal government is working with partners to reach the national goal. Reauthorize the Child Nutrition Act: The Administration is requesting an historic investment of an additional $10 billion over ten years starting in 2011 to improve the quality of the National School Lunch and Breakfast program, increase the number of kids participating, and ensure schools have the resources they need to make program changes, including training for school food service workers, upgraded kitchen equipment, and additional funding for meal reimbursements. With this investment, additional fruits, vegetables, whole grains, and low-fat dairy products will be served in our school cafeterias and an additional one million students will be served in the next five years. Double the number of schools participating in the Healthier US School Challenge: The Healthier US School Challenge establishes rigorous standards for schools’ food quality, participation in meal programs, physical activity, and nutrition education – the key components that make for healthy and active kids – and provides recognition for schools that meet these standards. Over the next school year, the U.S. Department of Agriculture, working with partners in schools and the private sector, will double the number of schools that meet the Healthier US School Challenge and add 1,000 schools per year for two years after that. We are bringing to the table key stakeholder groups that have committed to work together to improve the nutritional quality of school meals across the country. New Commitments from Major School Food Suppliers: School food suppliers are taking important first steps to help meet the Healthier US School Challenge goal. Major school food suppliers including Sodexho, Chartwells School Dining Services, and Aramark have voluntarily committed to meet the Institute of Medicine’s recommendations within five years to decrease the amount of sugar, fat and salt in school meals; increase whole grains; and double the amount of produce they serve within 10 years. 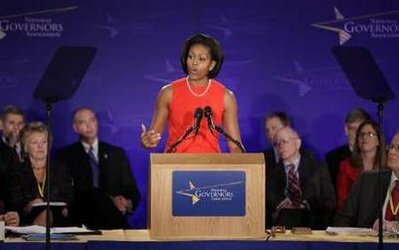 By the end of the 2010-2011 school year, they have committed to quadruple the number of the schools they serve that meet the Healthier US School Challenge. School Nutrition Association: The School Nutrition Association (SNA), which represents food service workers in more than 75% of the nation’s schools, has joined the Let’s Move campaign. Working with other education partners, SNA has committed to increasing education and awareness of the dangers of obesity among their members and the students they serve, and ensuring that the nutrition programs in 10,000 schools meet the Healthier US School Challenge standards over the next five years. School Leadership: Working with school food service providers and SNA, the National School Board Association, the Council of Great City Schools and the American Association of School Administrators Council have all embraced, and committed to meeting, the national Let’s Move goal. 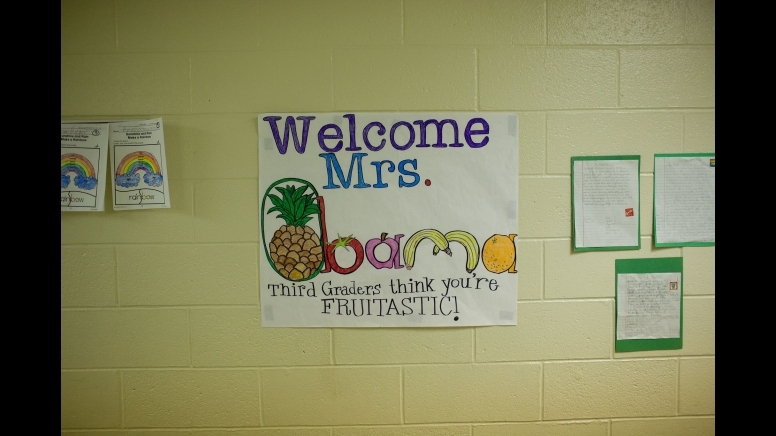 The Council of Great City Schools has also has set a goal of having every urban school meet the Healthier US Schools gold standard within five years. The American Association of School Administrators has committed to ensuring that an additional 2,000 schools meet the challenge over the next two years. 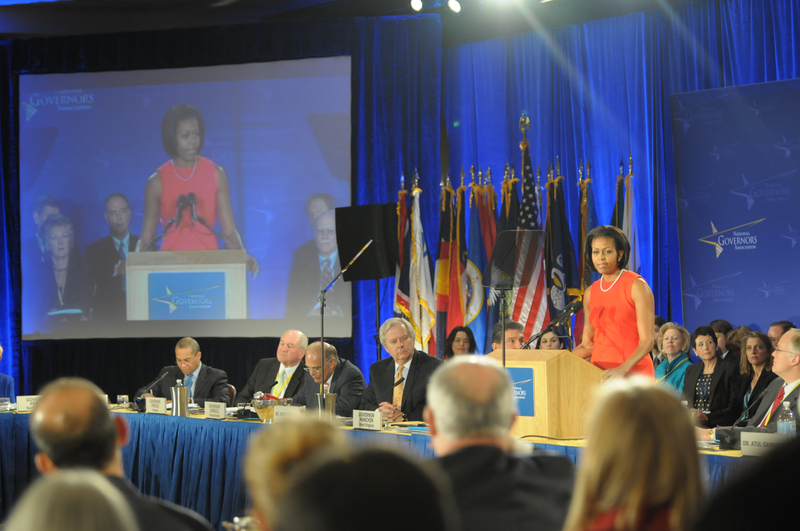 These combined efforts will touch 50 million students and their families in every school district in America. 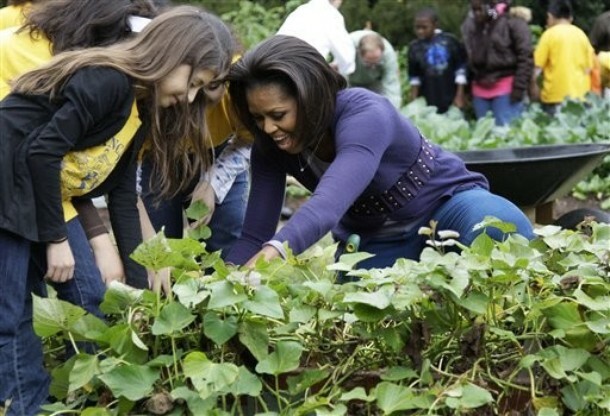 First Lady Michelle Obama thanks students from Bancroft Elementary School and Kimball Elementary School for helping harvest vegetables on the South Lawn of the White House on October 29, 2009 in Washington, DC. 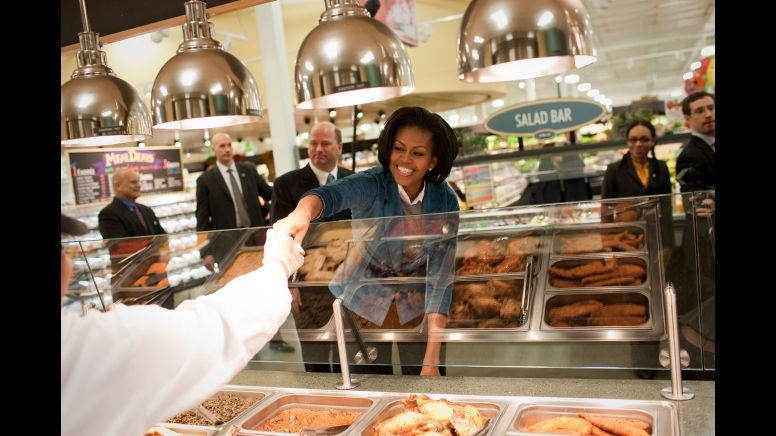 Eliminate Food Deserts: As part of the President’s proposed FY 2011 budget, the Administration announced the new Healthy Food Financing Initiative – a partnership between the U.S. 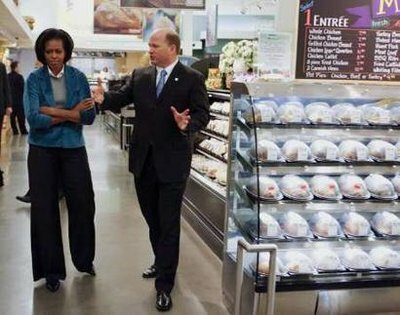 Departments of Treasury, Agriculture and Health and Human Services that will invest $400 million a year to help bring grocery stores to under-served areas and help places such as convenience stores and bodegas carry healthier food options. 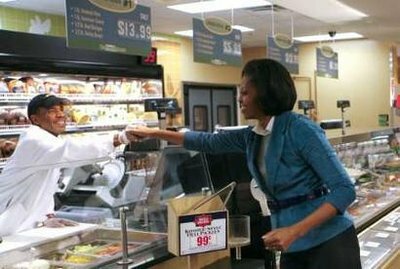 Through these initiatives and private sector engagement, the Administration will work to eliminate food deserts across the country within seven years. 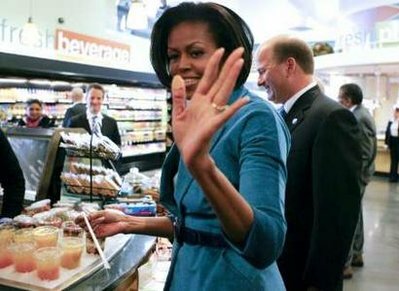 Increase Farmers Markets: The President’s 2011 Budget proposes an additional $5 million investment in the Farmers Market Promotion Program at the U.S. Department of Agriculture which provides grants to establish, and improve access to, farmers markets. 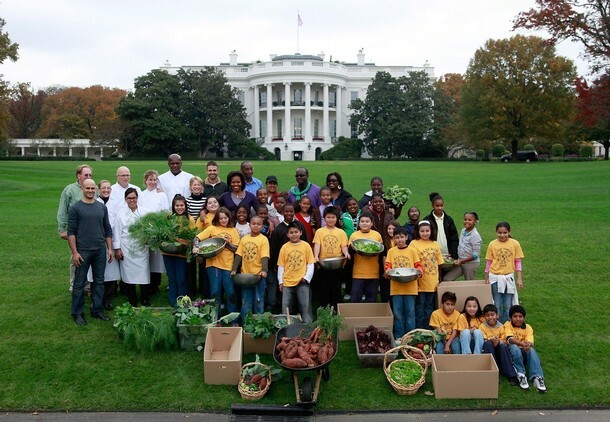 First Lady Michelle Obama and students from Bancroft Elementary School and Kimball Elementary School pose for a photograph with freshly harvested vegetables on the South Lawn of the White House on October 29, 2009 in Washington, DC. Expanding and Modernizing the President’s Physical Fitness Challenge: In the coming weeks, the President will be naming new members to the President’s Council on Physical Fitness and Sports, housed at the U.S. Department of Health and Human Services. The council will be charged with increasing participation in the President’s Challenge and with modernizing and expanding it, so that it is consistent with the latest research and science. 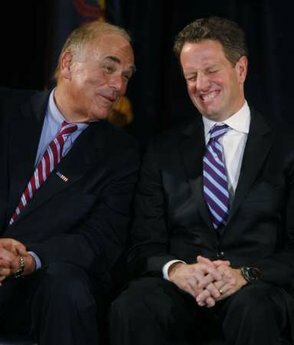 For more information, please visit www.letsmove.gov.